Tears For Fears to perform at Castle Park, Colchester on Sunday 28th July 2019. Tears For Fears will perform in Essex this summer! The iconic duo have announced a very special concert at Colchester Castle Park on Sunday 28 July 2019, bringing their extensive catalogue of hits to Colchester in what promises to be an incredible evening of music. 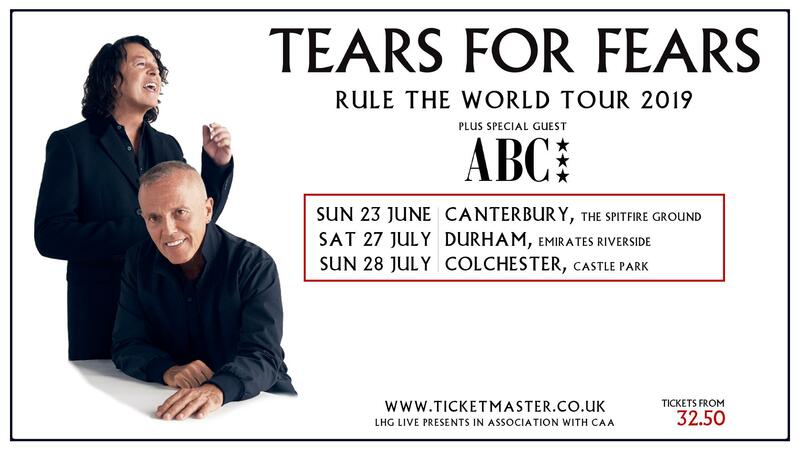 Following on from a hugely successful indoor Arena Tour, Tears For Fears have announced that they will play only a select number of outdoor summer shows and Colchester Castle Park has been chosen as one of these venues. The band know that this part of the world has a very vibrant audience! Tickets go on sale from 9.00am Friday 8 March 2019. Tears For Fears are Roland Orzabal (vocals, guitar and keyboards) and Curt Smith (vocals, bass and keyboards). With sales of over 30 million albums worldwide, their songs have resonated and resounded throughout popular culture since 1981, yet they’re even more apropos than ever in the 21st century. Everyone from Kanye West and The Weeknd to Drake and David Guetta has sampled a song from Tears For Fears. You can hear their timeless anthems piping through The Wire, Donnie Darko, Straight Outta Compton, Mr. Robot and more. Those songs comprise their first career-spanning Greatest Hits album; the aptly titled Rule the World; a bevy of enduring classics together such as Everybody Wants To Rule The World, Shout, Mad World, Woman In Chains, Pale Shelter, and more. For the set, they also teamed up to create their first new original compositions together since 2004: I Love You But I’m Lost and Stay. Powered by shimmering upbeat keys and expansive production, the former shuffles into a hauntingly hypnotic admission on the refrain, I Love You But I’m Lost. Meanwhile, hushed acoustic guitar entwines with a gorgeous vocalization on Stay - as icy electronics reverberate. In many ways, Rule The World brings things full circle for the group. Following their emergence, they released a string of classic albums, namely the gold-certified debut The Hurting quintuple-platinum BRIT Award-winning Songs from the Big Chair and Seeds of Love. The latter would be Roland and Curt’s last collaboration together until Everybody Loves A Happy Ending in 2004. A three-year tour kicked off in 2010 as they touched down in North America, Japan, South Korea, Manila, and South America. 2013 saw them return with their first recorded music in a decade: a cover of Arcade Fire’s Ready to Start. Most recently, they co-headlined a sold-out arena run in North America with Hall & Oates and delivered standout sets at “British Summer Time” in Hyde Park and Rock In Rio. As their songs continue to soundtrack tomorrow’s generation, Tears For Fears forever represent the sound of the future. Everybody still wants to rule the world. Tickets for Tears for Fears at Colchester Castle Park on Sunday 28 July 2019 go on General Sale from 9.00am Friday 8 March 2019.